Over 70 species of non-salmonid fish use the Coos system at some point in their lives, including one endemic species (Millicoma dace), yet surprisingly little is known about the ecology, population or distribution of these fishes. The Coos system appears to provide a variety of habitat types that support high fish species richness. Figure 1. 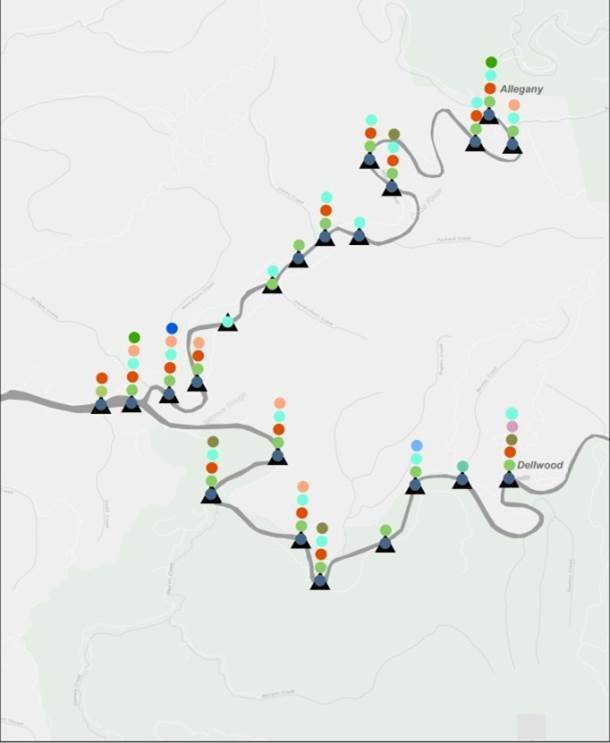 Study locations where Other Fish data were collected. At least 70 non-salmonid fish species (“other fishes”) inhabit the Coos estuary and associated rivers at some point in their life cycle (see Table 1 for a list of those documented in the last 5 years). “Other” fishes use the estuary and its tributaries variously: some marine fishes may live in the lower, more saline reaches of the estuary as adults (e.g., Cabazon and lingcod inhabiting the waters around rock jetties); some live most of their adult life in the ocean, but come into the estuary to spawn (e.g. Pacific herring or topsmelt);some spawn in the ocean as adults, but their larvae or juveniles enter the estuary to take advantage of productive nursery habitat (e.g. rockfish living in eelgrass beds). Other fishes live in the brackish waters (e.g. shiner perch) or fresh waters (e.g. stickleback, longnose dace) of the Coos estuary through all stages of their life cycles. Unfortunately, distribution and abundance of Other Fish species in the Coos estuary are poorly understood since these species have not, for the most part, been the subject of targeted studies. This document summarizes available information describing the distribution, abundance and conservation status of Other Fish species found in the Coos estuary. Brief Other Fishes summaries, organized in alphabetical order by species common name, are divided into the three sections corresponding to adult phase habitats: Marine Fishes, Estuary Fishes, and Freshwater Fishes. The final summary, Infrequently Encountered Fishes, details available information about fishes who appear to be only occasional Coos estuary residents. The presence and distribution information in these summaries rely primarily on the findings of the Oregon Department of Fish and Wildlife’s long-term seining program (1965-present)(ODFW 2013b) and fish seining conducted by scientists and students at the Oregon Institute of Marine Biology in 2013 (OIMB 2013)(Figure 1). ODFW’s long-term seining program initially sampled all fishes in the Coos system but ultimately shifted to monitoring only Chinook salmon. Other Fishes are still identified and counted during Chinook sampling, but large numbers of non-salmonid species are estimated. There are additional limitations to the data in the sampling methods used. Seining methods have remained standard over the years, but fish identification varies by staff abilities and species are typically not verified using keys. Identification of rare fishes is especially questionable. In addition, the seining effort was not identical in all years (some sites were missed— especially after the sampling focus shifted to Chinook) and during some years sampling was skipped altogether. Finally, seining methods may have inadvertently introduced bias into the sampling since seining is not effective at capturing all fish (e.g., larger more mobile fish species). 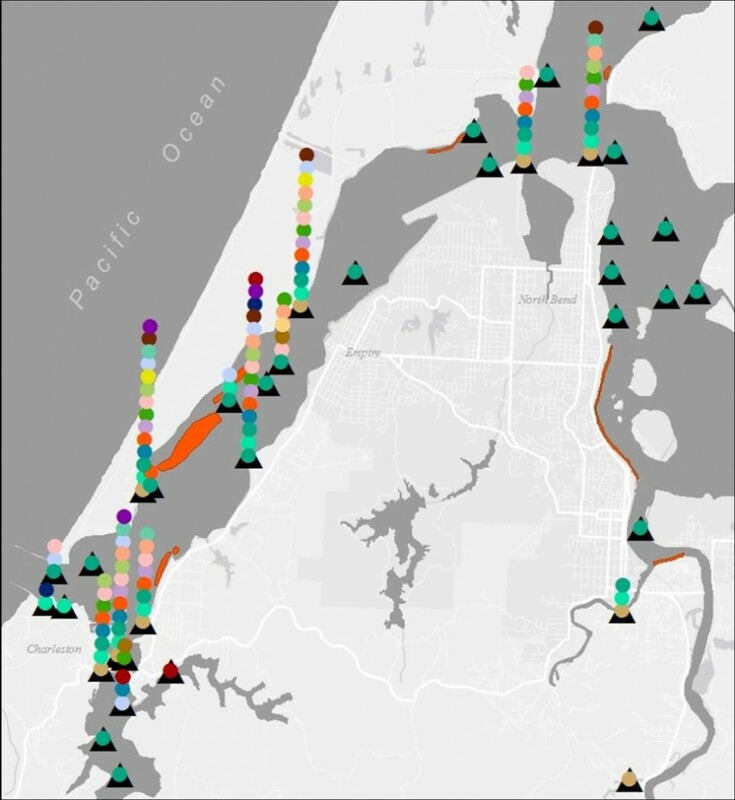 Oregon Institute of Marine Biology’s (OIMB) fish data were collected during day and nighttime trawls at two locations in the lower Coos estuary (Figure 1) during summer 2013 as part of its Biology of Fishes class. 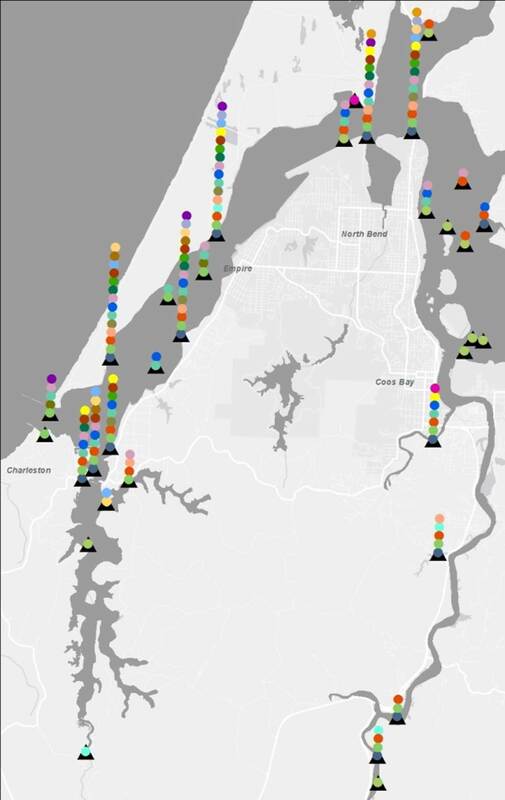 OIMB scientists and students also seined at six locations in the lower estuary (Figure 1). The goal of the study was to examine the diversity of fish species in a variety of habitats. Identification of fish to the species level was an important component of the class. Species identification was attempted in the field by students and in most cases a specimen was brought back to the lab for confirmation by keying out fish using the following guides: Miller and Lea 1972; Hart and Clemens 1973; Eschmeyer and Herald 1983; Kramer et al. 1995. In all cases, final confirmation of species identification was provided by Biology of Fishes Professor, Wade Smith, a specialist in marine fishes. The Other Fish life history information reported in these summaries relies primarily on the work of Monaco and Emmett, specifically Volume II of their two-part series describing fishes and invertebrates in US west coast estuaries (Monaco and Emmett 1990). The Other Fishes summaries are followed by a section describing researchers’ most recent understanding of how Other Fishes are using the Coos estuary. Table 1. List of documented fish species in the Coos system in the past 5 years (2008-2013). Compiled from: ODFW 2013a, ODFW 2013b, ODFW 2012, OIMB 2013, McPhail and Taylor 2009, G. Vonderohe, pers. comm., 2014. American shad (Alosa sapidissima) is a non-native anadromous fish species and is described with other non-native species in Chapter 18: Non-Indigenous and Invasive Species. Brown Irish lord (Hemilepidotus spinosus) were found most recently near Clam Island in the lower Coos estuary in 2013 (OIMB 2013) and have been caught infrequently in the lower estuary by ODFW (ODFW 2013b). Butter sole (Pleuronectes isolepis), one of two dominant flatfishes found off the Oregon Coast (the other being English sole- see below) and considered common in the Coos estuary (W. Smith, pers. comm., 2014), were found in 2013 near Clam Island in the lower estuary (OIMB 2013). Over 20 individuals were netted and released. Butter sole have a relatively short spawning period (February-May)(Richardson et al. 1980). No other data on species abundance or distribution are available. 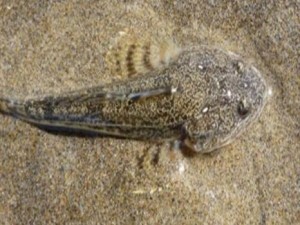 Cabezon (Scorpaenichthys marmoratus), a species of sculpin, have been regularly found as juveniles in the lower estuary by ODFW (ODFW 2013b), and near Clam Island, also in the lower estuary, by OIMB (OIMB 2013). Over the course of a 2+ year study, Schlosser and Bloeser (2006) found Cabazon to be nearly as abundant as black rockfish during the course of their study (Figure 3), and most abundant near mud and sandy substrates associated with drift algae. English sole (Pleuronectes vetulus) juveniles were found on multiple sampling runs by ODFW in the Coos River system, and have been consistently captured in the lower estuary and South Slough systems, sometimes by the hundreds (ODFW 2013b). Numerous English sole juveniles were caught in 2013 near Clam Island and near the North Jetty by OIMB (OIMB 2013). For the west coast as a whole, English sole harvests, subject to both regulatory and market-driven fluctuations, were at near historic lows at the time of a National Marine Fisheries Service report by Stewart (2005). The same report shows English sole spawning biomass increased from 1995 to 2005. While English sole adults are rarely found in estuaries, juveniles are common in estuarine habitats which function as juvenile fish nurseries (Lassuy 1989a). Not surprisingly, in the Coos system, juveniles can be found year-round in the estuary, most abundantly April to November (Monaco and Emmett 1990). Rooper et al. (2003) studied habitat types in multiple estuaries along the west coast and determined the highest density of juvenile English soles were found in “Lower Side Channel” habitat, which in the Coos system they designated as the South Slough. They also found the average English sole juvenile density decreased with decreasing salinities; smaller juveniles appeared to be more sensitive to salinity changes. English sole juveniles were also highly correlated with bottom habitat, preferring medium or fine grain sand. In a species profile by Lassuy (1989a), English sole juveniles were said to aggregate in estuary nursery areas for about a year before moving towards progressively deeper waters and ultimately leaving the estuary as 5 ½” to 6” (140-150mm) juveniles. Additionally, Lassuy (1989a) and Kruse (1984) describe how females of this commercially important species are harvested in higher numbers (90% of total catch) in commercial fisheries since males rarely reach harvestable size. English sole is also an important fish for understanding water and sediment pollution levels since the fish are prone to accumulating contaminants in their flesh, which can form visible cancerous lesions or tumors (Sigmon et al. 2006). Eulachon (Thaleichthys pacificus), a small anadromous fish, is a federally listed threatened species (Oregon Biodiversity Information Center 2013). They are found only rarely in the Coos estuary (Monaco and Emmett 1990). Jacksmelt (Atherinopsis californiensis) schools have been documented inside the estuary on several occasions by ODFW, most recently in 1998 (ODFW 2013b). Kelp greenling (Hexagrammos decagrammus) were found by Schlosser and Bloeser (2006) to inhabit kelp beds with mud bottoms in the Coos estuary, being the third most abundant catch during their study, behind black rockfish and Cabezon (Figure 3). Wagoner et al. (1990) reported that Kelp greenling are often found in lower portions of the Coos estuary. They’ve also been documented on numerous occasions in the lower estuary and mouth of South Slough by ODFW, who last caught kelp greenling in 2013 (ODFW 2013b). Recently, a greenling was caught near the North Jetty in the lower estuary by OIMB (OIMB 2013). Lingcod (Ophiodon elongatus) adults have infrequently been found by ODFW in the lower estuary; they last documented several in 2013 (ODFW 2013b). Juvenile lingcod were found near Clam Island and near the North Jetty by OIMB in 2013 (OIMB 2013). Lingcod are rarely found in the Coos estuary as adults, although larvae and juveniles are found fairly regularly— generally in January and February (larvae); or April through August (juveniles) (Monaco and Emmett 1990). Wagoner et al. (1990) described the data gaps in scientists’ understanding of lingcod stocks but noted the existence of a recreational fishery off the rock jetties in lower portions of the Coos estuary. 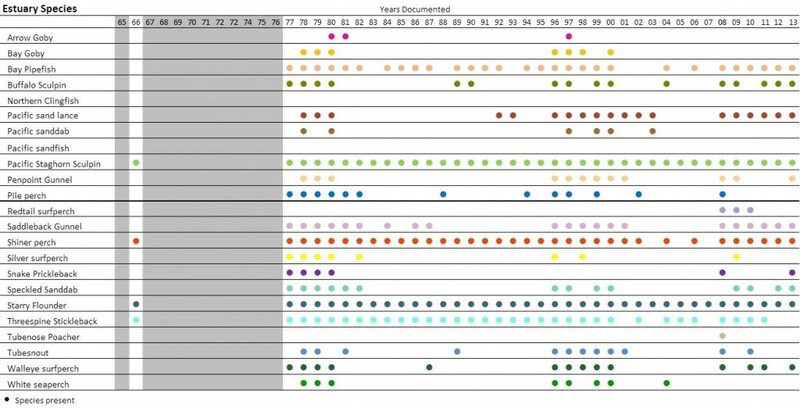 Figure 3: Counts of each species combined for all sampling events at Coos Bay from June 2003 to December 2005. 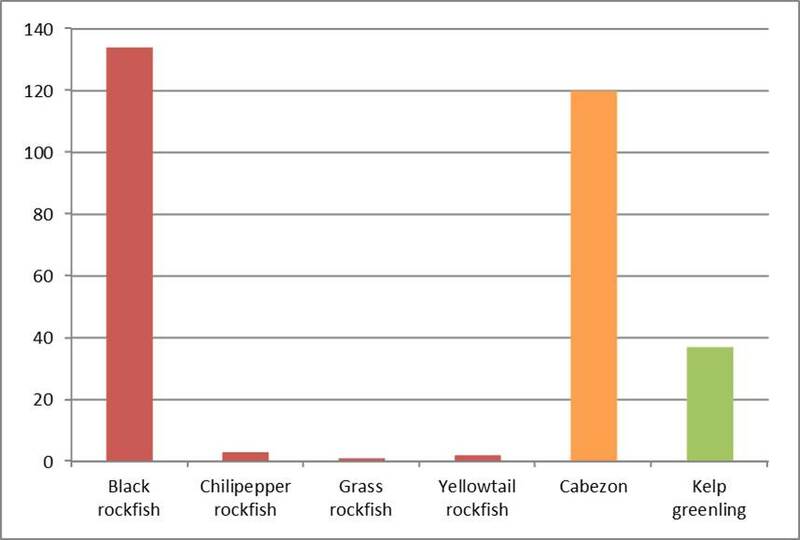 Red bars represent rockfish species, the orange bar is cabezon and green is kelp greenling. Data: Schlosser and Bloeser 2006. Longfin smelt (Sprinchus thaleichthys) are small anadromous fish found only once (in 1978) by ODFW in the Coos estuary (ODFW 2013b). Longfin smelt life stages all occur within the estuary (Monaco and Emmett 1990): in the fall, juveniles and adults use the upper tidal freshwater reaches of the estuary; during the winter, adults spawn in these regions and then die; in the spring and summer, juveniles move to the marine-dominated lower portions of the estuary (Monaco and Emmett 1990). Figure 2: Documented locations of marine fish in the Coos estuary both historically and currently. This is an under-representation of marine speciess, since only stations where GPS coordinates were documented are shown. Stations adjacent to each other showing same data were also removed to enhance map readability. Compiled from: Hayslip et al 2006; Miller and McRae 1978; Miller and Shanks 2004 and 2005; ODFW 2013b, OIMB 2013; Rooper et al 2003. Table 2: Years marine fish were documented in the Coos estuary. Grayed out portions coincide with years no seining took place for the ODFW seining project. Compiled from: Hayslip et al 2006; Miller and McRae 1978; Miller and Shanks 2004 and 2005; ODFW 2013b, OIMB 2013; Rooper et al 2003. Northern anchovy (Engraulis mordax) have been found by ODFW on numerous occasions in both the Coos estuary and Coos River, most recently in 2012 (ODFW 2013b). ODFW reports having sometimes caught Northern Anchovy in the hundreds. Adults and juveniles migrate into the Coos estuary during summer months. 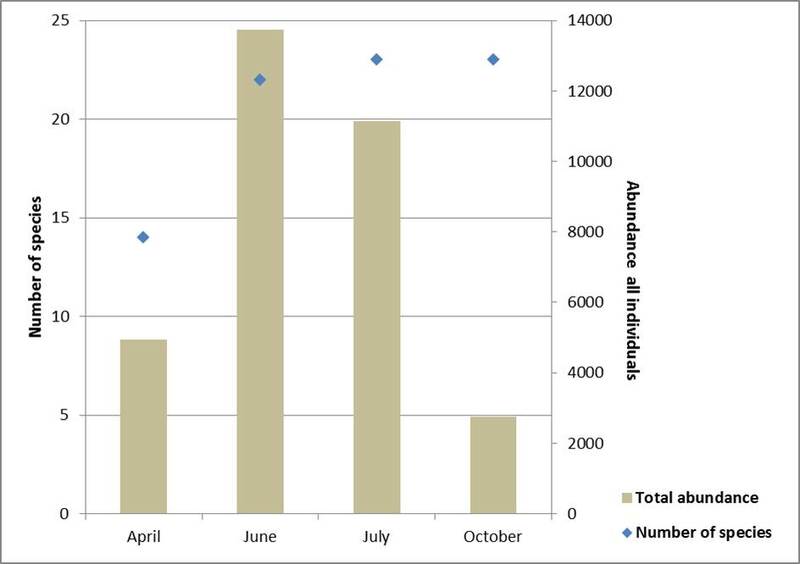 Adults are found most abundantly June through November and juveniles April through November (Monaco and Emmett 1990). Northern anchovy are a commercially important bait fish as well as important prey for many birds species, including the California brown pelican (Monaco and Emmett 1990). Pacific herring (Clupea pallasii) is a schooling fish that returns to its natal estuary to spawn. Adults can be found in the Coos estuary January through September, but are most abundant at spawning times – January through April (Monaco and Emmett 1990). The Coos estuary is one of the Oregon coast’s major herring spawning destinations (Lassuy 1989b). 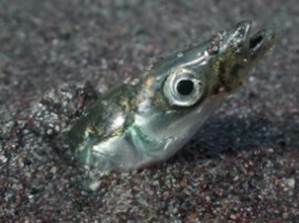 Juvenile Pacific herring can be found in the estuary April through November, but are most abundant June through September (Monaco and Emmett 1990). During a spawning event, eggs are attached to solid substrates such as eelgrass or rocks. Juveniles remain in inshore waters for the first few months before moving offshore, although some populations remain in estuarine waters (Stevenson 1962). The most recent information on distribution, time of spawning, and egg biomass in the Coos estuary was quantified by Miller and McRae in 1978. They found that the most extensively used spawning habitats were the eelgrass beds in the lower parts of estuary, while the densest spawning occurred on cargo docks in mid and upper parts of estuary. They noted that the rocky substrate at Fossil Pt. accounted for about one quarter of all spawning biomass in the Coos estuary (Figure 4) during the 1977-78 spawning season, which totaled an estimated 144.5 tons of eggs. This estimate should be considered minimal due to bird predation prior to sampling (e.g., Black Brant goose), eliminating as much as 90% of the eggs in the first week after spawning. ODFW reported finding juvenile Pacific herring mainly in the lower regions of the estuary often in extremely high numbers (>1,000 individuals per seine on multiple occurrences)(ODFW 2013b). Most recently (2013) ODFW again documented very high numbers estimated at about 1,000 individuals during two separate seining events. Pacific herring were also fund near Stacey Beach by OIMB in 2013 (OIMB 2013). Pacific sand sole (Psettichthys melanostictus) is a native flat fish that ODFW has frequently found during fish seining (ODFW 2013b). 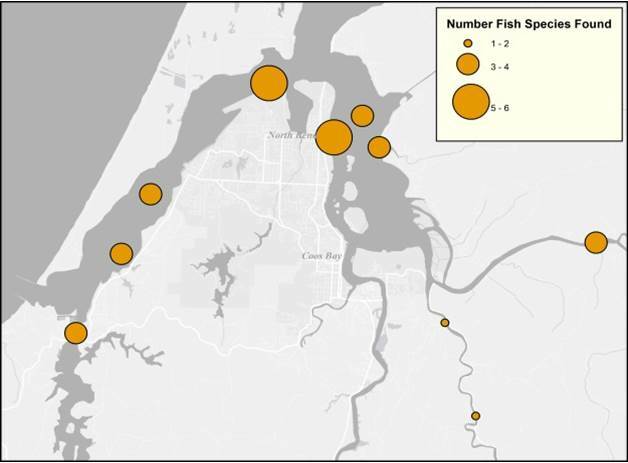 Pacific sand sole were found almost exclusively in the lower estuary and South Slough, sometimes in moderately large numbers (20-75 individuals). Pacific sardine (Sardinops sagax) is a schooling pelagic fish considered a keystone species due to the dozens of marine birds and mammals that depend on them as a major food source. Miller and Shanks (2004) found that Pacific sardine juveniles rearing in the Coos estuary were significantly larger than those from an adjacent outer coast site (Sunset Bay), though they were found less frequently in the estuary. The most recent stock assessment (2012) for the northern subpopulation of this species (which includes Oregon) concludes that they are not being overfished (Hill et al. 2012), though there is preliminary evidence from 2013/2014 landings that populations have declined since this report (Barboza 2014; Dillman 2013), possibly due to this species’ naturally fluctuating populations (e.g., effects of cold phase Pacific decadal oscillation). ODFW found Pacific sardines in the Coos estuary in 2010 but have not collected any since (ODFW 2013b). location of the Fossil Pt. station. Data: Miller and McRae 1978. Pacific tomcod (Microgadus proximus) is a schooling marine species often found as adults and juveniles in estuaries during May through August, mostly in the mixed and seawater zones (salinity > 0.5) of the Coos estuary (Monaco and Emmett 1990). Pacific tomcod have been found three times in the lower estuary by ODFW, most recently in 1999 (ODFW 2013b). Red Irish lord (Hemilepidotus hemilepidotus) is a fish in the sculpin family noted by Wagoner et al. (1990) to be found in lower portions of the Coos estuary, although population data are unavailable for this species. ODFW has found them twice in the lower estuary, most recently in 2000 (ODFW 2013b). Rockfish (Sebastes spp. ), such as black and copper rockfish (Sebastes melanops and S. caurinus), are generally only found in the Coos estuary as juveniles. Miller and Shanks (2004) found more juvenile Pacific rockfish inside the Coos estuary than at an adjacent coastal site (Sunset Bay). Schlosser and Bloeser (2006) trapped juvenile rockfish, Cabazon and greenlings monthly from 2003-2005 at multiple estuaries and found that rockfish preferred eelgrass or sand bottom associated with drift algae habitat in the Coos estuary. Black rockfish were by far the most common rockfish found in the Coos estuary during their study (Figure 3). OIMB found black rockfish near the North Jetty in the lower Coos estuary (OIMB 2013). Multiple rockfish of unknown species were also collected during a seining event near Clam Island by the same group. ODFW has frequently found copper and black rockfish juveniles in their seining and has also occasionally found brown rockfish (Sebastes auriculatus), blue rockfish (Sebastes mystinus), and bocaccio rockfish (Sebastes paucispinis)(ODFW 2013b). Rockweed gunnel (Apodichthys fucorum) have only occasionally been documented inside the lower Coos estuary, most recently in 2000 by ODFW (ODFW 2013b). Silver spotted sculpin (Blepsias cirrhosis) have been found by OIMB at Tunnel Beach in the lower Coos Bay in 2013 (OIMB 2013). ODFW has documented silver spotted sculpin a handful of times, most recently in 2009 (ODFW 2013b). Striped bass (Morone saxatilis) are an introduced sport fish and as such will be discussed in the Chapter 18: Non-Indigenous and Invasive Species. Striped seaperch (Embiotoca lateralis), known to occur and spawn in the Coos estuary, were found near the North Jetty in the lower estuary by OIMB in 2013 (OIMB 2013). ODFW has generally found these fish at lower estuary sites, most recently in 2011 (ODFW 2013b). Surf smelt (Hypomesus pretiosus) is an important recreational fish as well as a valuable prey species for many birds and mammals. Surf smelts are abundant year-round in the Coos estuary as juveniles (especially April through October) while adults are generally only found in high numbers from June through August (Monaco and Emmett 1990). Larvae can also be found in the Coos estuary, but only in high salinity regions (>25)(Monaco and Emmett 1990). Juvenile and adult surf smelts were found in large numbers (~580 individuals) at Coast Guard Cove in the lower estuary, and in smaller numbers at Tunnel Beach and Sitka Dock by OIMB in 2013 (OIMB 2013). ODFW has found surf smelts in lower regions of the estuary, but occasionally high numbers appeared in the Coos River systems (ODFW 2013b). In 2013, ODFW found high numbers of both adults and juvenile surf smelt (estimated >1,000 individuals per seine on multiple occurrences), most recently in lower Coos estuary sampling sites. Tidepool sculpin (Oligocottus maculosus) were found by OIMB in 2013 in several seines in the Joe Ney Slough (OIMB 2013). ODFW also found these fish in 2000 at their Sitka dock site in the lower estuary (ODFW 2013b). Miller and Shanks (2005) found several tidepoll sculpin individuals near the entrance to Joe Ney Slough in 2000. Tidepool snailfish (Liparis florae) were found by ODFW in the lower Coos estuary at the Empire boat ramp in 2010 (ODFW 2013b). Topsmelt (Atherinops affinis) is a schooling marine fish that spends much of its life in the marine-dominated (salinity >25) parts of estuaries (Monaco and Emmett 1990). All topsmelt age classes are highly abundant in the Coos estuary, especially during times of peak spawning (May through July), where eggs are laid primarily on eelgrass or tideflat algae in the estuary (Monaco and Emmett 1990). ODFW found topsmelt in the upper and lower portions of the estuary, as well as the Coos River; most recently in 2012 (ODFW 2013b). Wolf Eel (Anarrhichthys ocellatus) can be found around jetties in the lower estuary, or at Fossil Pt., although information on abundance and life history in the Coos estuary is lacking for this species (Wagoner et al. 1990). Arrow goby (Clevelandia ios) is an estuary-dependent fish whose life stages all occur in the estuary (Monaco and Emmett 1990). Frequently associated with ghost shrimp burrows (Callianasa californiensis), in the Coos estuary arrow gobies have been found using (mainly unoccupied) ghost shrimp burrows at Jordan Cove (Hoffman 1980). They’re found in intertidal areas in spring and summer and in subtidal channels during fall and winter (Monaco and Emmett 1990; Hoffman 1980). ODFW has found arrow gobies mainly in the upper estuary as recently as 1997 (ODFW 2013b). Table 3: Years estuary fish were documented in the Coos estuary. 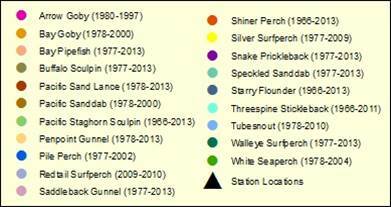 Grayed out portions coincide with years no seining took place for the ODFW seining project. Compiled from: ODFW 2013b, OIMB 2013; Hayslip et al 2006; Sigmon et al 2006; Miller and Shanks 2005; Hoffman 1980.
since only stations where GPS coordinates were documented are shown. 2006; Miller and Shanks 2005; Hoffman 1980. Bay Goby (Lepidogobius lepidus) also use ghost shrimp burrows in intertidal flats as well as eelgrass beds. They can be found throughout the length of the Coos estuary, although specific data on their population are lacking (Wagoner et al. 1990). In a long term monitoring program by ODFW (1965-present), bay goby were found on multiple occasions in upper and lower regions of the estuary, most recently in 2000 (ODFW 2013b). Bay Pipefish (Syngnathus leptorhynchus) are frequently found in estuarine habitats, especially eelgrass beds (Wagoner et al. 1990). ODFW has consistently found both adult and juvenile bay pipefish throughout the Coos estuary, as far up as the confluence of the Millicoma and South Fork Coos Rivers (ODFW 2013b). They were found by OIMB in 2013 in Joe Ney Slough (OIMB 2013). Buffalo Sculpin (Enophrys bison) are often found in intertidal eelgrass beds in the lower Coos estuary (Wagoner et al. 1990). 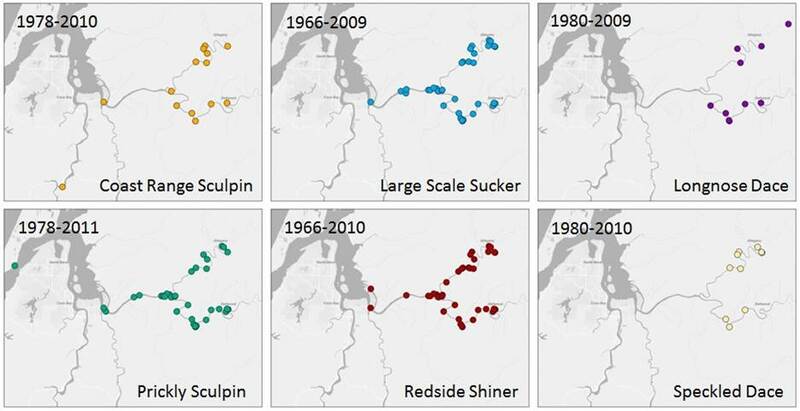 ODFW has regularly found small numbers of buffalo sculpin in the lower estuary, most recently in 2012 (ODFW 2013b). OIMB found several buffalo sculpin near Clam Island and the North Jetty in the lower estuary in 2013 (OIMB 2013). Northern Clingfish (Gobiesox maeandricus) can be found in waters near rock jetties in the lower estuary, or at Fossil Pt. (Wagoner et al. 1990). Pacific sand lance (Ammodytes hexapterus) are a slender schooling fish that have the unique habit of burrowing into sand – a behavior mainly exhibited during non-reproductive periods in the late fall to early spring, as well as at night during the rest of the year (Hiss 1985). In the Coos estuary, they’re most commonly found in seawater zones (salinity >25) April through October (Monaco and Emmett 1990). ODFW has found Pacific sand lance in the lower Coos estuary as recently as 2013, frequently in exceedingly high numbers of both adults and juveniles (multiple seines greater than 500 individuals)(ODFW 2013). The presence of both age classes supports the idea that Pacific sand lance is not a migratory species (Hiss 1985). Pacific sand lance require clean sandy areas in which to burrow, generally in high flow areas in order to maintain good oxygenation. This habitat is often found at the mouths of estuaries (Monaco and Emmett 1990). Pacific sand lance are important prey for many bird species, as well as many fish species, including juvenile salmonids. 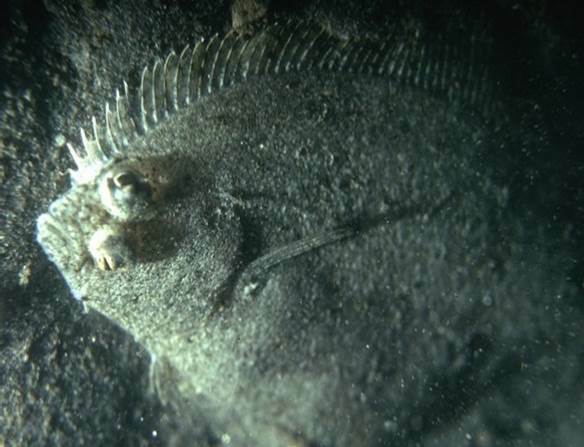 Pacific sanddab (Citharichthys sordidus) are a medium flatfish that have been found only occasionally in the Coos estuary (lower estuary or mouth of South Slough) by ODFW, most recently in 2000 (ODFW 2013b). Pacific sandfish (Trichodon trichodon) are mainly found in sandy habitat in lower reaches of the Coos estuary (Wagoner et al. 1990). Pacific Staghorn sculpin (Leptocottus armatus) are found in great abundance year-round in all parts of the estuary mostly in sandy habitats (Monaco and Emmett 1990). 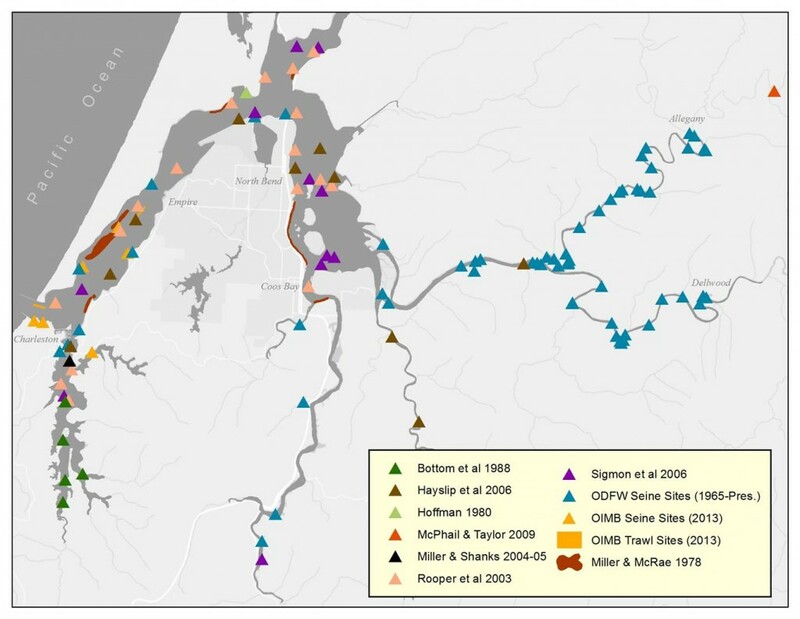 ODFW has routinely found abundant numbers of both juvenile and adult staghorn sculpin near Dellwood on the South Fork Coos River, near Allegany on the Millicoma River, past Shinglehouse Slough in Isthmus Slough, and throughout the Coos estuary (ODFW 2013b)(Figure 5). OIMB found Pacific staghorn sculpin near Clam Island and near the North Jetty in the lower estuary in 2013 (OIMB 2013). Multiple individuals were also found by OIMB at Tunnel Beach, Stacey Beach and Joe Ney Slough. Penpoint Gunnel (Apodichtys flavidus) are often found in eelgrass beds in the lower estuary (Wagoner et al. 1990). ODFW has found penpoint gunnel infrequently, generally between the McCullough bridge and the mouth of the Coos estuary, as recently as 2013 (ODFW 2013b). Miller and Shanks (2005) found penpoint gunnel each year (1998-2001) near the entrance to South Slough in numbers as high as 578 (1999). Pile perch (Damalichthys vacca) have been found as both juveniles and adults at the mouth of South Slough and in lower and upper portions of the estuary on numerous occasions by ODFW, most recently in 2002 (ODFW 2013b). Redtail surfperch (Amphistichus rhodoterus) have been found in both lower and upper portions of the Coos estuary by ODFW as recently as 2013 (ODFW 2013b). Saddleback Gunnel (Pholis ornate) are often found in eelgrass beds in the lower Coos estuary (Wagoner et al. 1990). ODFW has found saddleback gunnel on numerous occasions in the lower estuary, most recently in 2013 (ODFW 2013b). 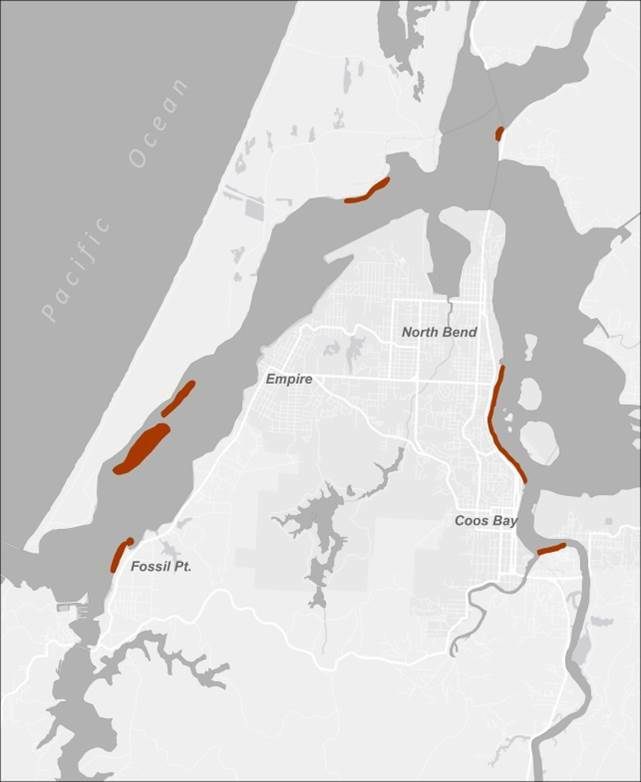 OIMB found several near Clam Island and the North Jetty in the lower Coos estuary and in Joe Ney Slough in 2013 (OIMB 2013). Shiner perch (Cymatogaster aggregata) are commonly found in all parts of the Coos estuary and are known to spawn here (Wagoner et al. 1990). Both adult and juvenile shiner perch are commonly found by ODFW throughout the Coos estuary and the Coos and Millicoma River sampling areas in high numbers (>1,000 individuals per seine on multiple occurrences)(ODFW 2013). Numerous shiner perch were also captured at Joe Ney Slough by OIMB in 2013 (OIMB 2013). Although no recent studies have specifically investigated the population and distribution of this species, Wagoner et al. (1990) noted that shiner perch historically contributed to the majority of fishes retained by anglers –they cite that 58% of total fish caught in Coos Bay in 1971 were from the surfperch family. Monaco and Emmett (1990) describe shiner perch as highly abundant in the Coos estuary with highest numbers found between May and August. They also reported that July is the peak month of parturition (shiners give birth to live young), which means that juvenile shiner perch are most abundant July through October. Shiner perch are commonly associated with aquatic vegetation, docks or pilings – on sand or muddy bottoms (Bane 1968). Silver surfperch (Hyperprosopon ellipticum) have been found by ODFW on numerous occasions (primarily juveniles), most recently in 2009 (ODFW 2013b). 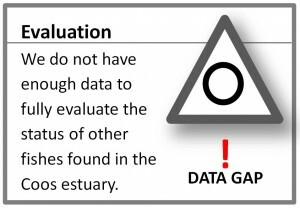 No information on habitat use in the Coos estuary is available. Snake Prickleback (Lumpenus sagittal) are often found in eelgrass beds in the lower estuary (Wagoner et al. 1990). ODFW has occasionally found snake prickleback (primarily in the lower estuary), as recently as 2013 (ODFW 2013b). OIMB found one individual near Clam Island in 2013 (OIMB 2013). Speckled Sanddab (Citharichthys stigmaeus) are mainly found in lower Coos estuary sandy habitats (Wagoner et al. 1990). ODFW found speckled sanddab in the lower estuary as recently as 2013 (ODFW 2013b). OIMB found numerous speckled sanddabs near Clam Island and near the North Jetty in the lower estuary in 2013 (OIMB 2013). Starry flounder (Platichthys stellatus, formerly Pleuronectes stellatus) are flatfish found in all parts of the estuary as far up as the heads of tide. ODFW found juvenile starry flounder near Dellwood on the South Fork Coos River, near Allegany on the Millicoma River, past Shinglehouse Slough in Isthmus Slough, and in the main part of the Coos estuary, as recently as 2013 (ODFW 2013b). Wagoner et al. (1990) report that starry flounder abundance has been down since the early 1970’s. Monaco and Emmett (1990) report that starry flounder adults and juveniles can be found in low numbers year-round in the Coos estuary in both mixed and marine-dominated zones (salinity > 0.5). They also report that juveniles are most abundant during May – August. Preferred habitat for starry flounder is sand or mud soft bottoms. Three-spined stickleback (Gasterosteus aculeatus) are found year-round throughout the Coos estuary and into freshwater rivers and streams, in slow moving waters with soft mud or sand bottoms. Juveniles and adults form loose schools and are most abundant in the Coos estuary during August – October (Monaco and Emmett 1990). ODFW has found three-spined stickleback frequently and in large numbers (100’s of individuals on multiple occasions) almost exclusively in the Coos River system, most recently in 2011 (ODFW 2013b). Coos Watershed Association (CoosWA) has found this species at Larson and Palouse Creeks in the Haynes Inlet drainage, during their annual Coho life-cycle monitoring project. They were caught all years in both creeks (2005 – present), and in higher numbers in Palouse Creek (>100 + most years)(CoosWA 2012). Tubenose Poacher (Pallasina barbata) is mainly found in lower reaches of the Coos estuary, in sandy bottom habitat or eelgrass beds (Wagoner et al. 1990). Tubesnout (Aulorhynchus flavidus) are often found in eelgrass beds in the lower estuary (Wagoner et al. 1990). ODFW (2013b) and Miller and Shanks (2005) found tubesnout in both the lower and upper portions of the Coos estuary, as recently as 2010. Walleye surfperch (Hyperprosopon argenteum) were found as recently as 2013 by ODFW from the lower Coos estuary to the mouth of the Coos River (ODFW 2013b). White seaperch (Phanerodon furcatus) were found as recently as 2004 by ODFW in most sections of the estuary and in the Coos River (ODFW 2013b). Figure 6: Location of freshwater fish species documented in the Coos River system, historically and currently (date ranges shown top left of each map). This is an under-representation, since only stations where GPS coordinates were documented are shown. Compiled from: ODFW 2013b, McPhail and Taylor 2009. Table 4: Years freshwater fish were documented in the Coos estuary. Grayed out portions coincide with years no seining took place for the ODFW seining project. Compiled from: ODFW 2013b, McPhail and Taylor 2009. Large Scale Sucker (Catostomus macrocheilus) is native to the Coos River system and fished recreationally (mostly as a bait species)(Wagoner et al. 1990). ODFW has caught large scale suckers only on several occasions, exclusively in the Coos and Millicoma River systems, sometimes by the hundreds, and most recently in 2009 (ODFW 2013b). Longnose dace (Rhinichthys cataractae) are small freshwater minnows that live in fast-flowing streams among gravel substrates. They are important prey for larger fishes including salmonids (Bisson and Reimers 1977). Locally, this species is known as the Millicoma dace and is recognized as a separate race, if not a separate subspecies, endemic to the Coos River system (ORBIC 2013; ODFW 2006; Kavanagh et al. 2005). McPhail and Taylor (2009) used DNA techniques to conclude that the Millicoma dace are unique enough to warrant their own species designation. Several fish species have been found very infrequently by ODFW during their long-term fish sampling program. These fish are either rare visitors to the Coos estuary, inhabit deeper parts of the estuary (so not typically captured by the beach seining techniques used by ODFW), or are not readily caught in seine nets. These fish include the following marine species: C-O sole (Pleuronichthys coenosus) caught once in 1996; Crescent gunnel (Pholis laeta) seen once in 1997; Curlfin turbot (Pleuronichthys decurrens) found in two different years, most recently 1996; the eel-like high cockscomb (Anoplarchus purpurescens) found twice, last in 1999; Padded sculpin (Artedius fenestrlis) last found in 1979; Rainbow seaperch (Hypsurus caryi) last documented in 1977; Rex sole (Glyptocephalus zachirus) found once in 1997; Rock greenling (Hexagrammos lagocephalus) documented in three different years, most recently in 2010; sablefish (Anoplopoma fimbria) documented at several stations in 1979; and sharpnose sculpin (Clinocottus acuticeps) found by Miller and Shanks (2005) each year (1998-2001) near the entrance to South Slough (highest numbers caught: 18 in 1999; caught most recently in 2010). In addition, Miller and Shanks found the following larvae or juvenile fishes in very small amounts (<5/year on average) except where otherwise noted: Bald sculpin (Clinocottus recalvus ) in 2000; Calico sculpin (Clinocottus embryum) in 1999-2001 (caught in variable numbers- maximum was 13 individuals in 2000); Mosshead sculpin (Clinocottus globiceps) in 1998, 2000, 2001 (caught in variable numbers- maximum was 14 individuals in 1998); Red Gunnel (Pholis schultzi) in 2000; Rock sole (Lepidopsetta bilineata) in 2001; Ronquil (Ronquilus jordani ) in 1999; Rosylip sculpin (Ascelichthys rhodorus) in 1998-2001 in relatively large quantities (241 in 1999); Smoothhead sculpin (Artedius lateralis) in 1998; Snailfish (Liparis sp.) in 1999-2001. ODFW found dace only infrequently, most recently in 2000, where substrate varied between sand and gravel to mud (ODFW 2013b). The Millicoma dace is federally listed as a species of concern (ORBIC 2013) and state rankings say it is “imperiled because of rarity or because other factors demonstrably make it very vulnerable to extinction or extirpation” (ODFW 2006). It has been found on both the West and East forks of the Millicoma River as well as the South Fork Coos River (Kavanagh et al. 2005). Prickly Sculpin (Cottus asper) are native to the Coos River system and are fished recreationally (mostly as a bait species)(Wagoner et al. 1990). ODFW found prickly sculpin in relatively large numbers (20+ individuals) on numerous occasions in both the Millicoma and Coos River systems, and found them most recently in 2011 near Dellwood (ODFW 2013b). Redside shiner (Richardsonius balteatus) is native to the Coos River system and recreationally fished (mostly as a bait species)(Wagoner et al. 1990). ODFW found redside shiners numerous times, almost exclusively in the Coos and Millicoma River systems. They have frequently been found by the hundreds as both juveniles and adults, most recently in 2010 (ODFW 2013b). Reticulate Sculpin (Cottus perplexus) live in rubble or gravel substrate of streams, often in riffles. They are a native fish in the Coos River system and are recreationally fished (mostly as a bait species)(Wagoner et al. 1990). Speckled dace (Rhinichthys osculus) are native to the Coos River system and recreationally fished (mostly as a bait species)(Wagoner et al. 1990). ODFW have found speckled dace on numerous occasions in the Millicoma and South Fork Coos, most recently in 2010 (ODFW 2013b). Figure 8: EMAP/CEMAP station locations. Size of symbol is proportional to the number of species found at each station during the 1999 survey. Data: Hayslip et al 2006; Sigmon et al 2006. 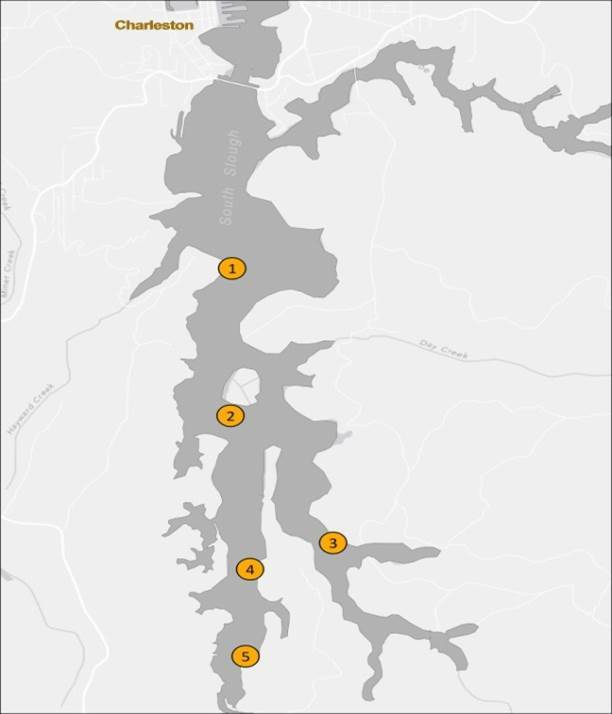 Figure 7:Locations of fish species infrequently encountered in the Coos estuary during ODFW’s long term seining program. 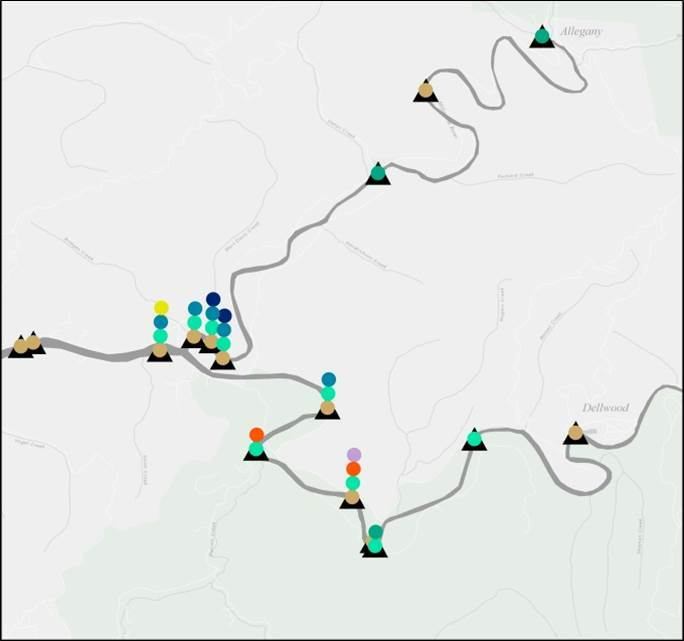 This is an under-representation of Infrequent Visitors, since only stations where GPS coordinates were documented are shown. Dates each species was found are shown next to each name. Data from: ODFW 2013b. Table 5: Years infrequently encountered fish were documented in the Coos estuary. Grayed out portions coincide with years no seining took place for the ODFW seining project. Compiled from: ODFW 2013b; Hayslip et al 2006; Miller and Shanks 2005. Despite scientists’ limited understanding of the populations and distribution of many native fish populations, a joint study by the United States Environmental Protection Agency (USEPA) and the Oregon Department of Environmental Quality (ODEQ) demonstrated the high diversity of species that exists in the Coos estuary. The project, called EMAP by USEPA (Hayslip et al. 2006), and CEMAP by ODEQ (Sigmon et al. 2006), measured fish abundance, species richness, and diversity in small estuaries from San Francisco to Puget Sound. Coos Bay sampling stations in 1999 produced a high of six species per trawl and nine out of 11 stations netted more than two species per trawl. In contrast, half of all stations in all estuaries sampled in the same year produced only one or two species per trawl, suggesting relatively high fish species diversity in the Coos estuary (Figure 8). Fish species found in the 1999 Coos estuary trawls are shown in Figure 9. Bottom et al. (1988) described the multiple habitats fishes use in estuaries by examining fish community structure in South Slough. 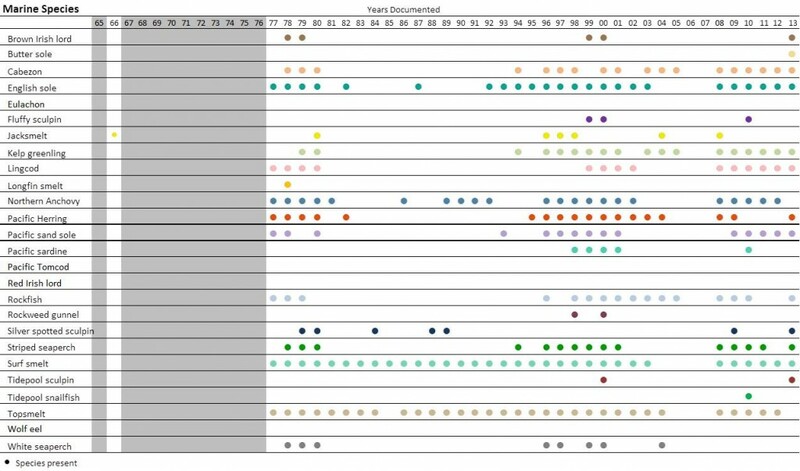 They seined five locations on four occasions, choosing the dry season (April-early Oct), so marine fishes using the estuary would be included in the study (Figure 10). For all but one station, they seined over mud flats near fringing marshes at high tide, and in tidal channels at low tide. One station was only sampled at low tide. Bottom et al. found that species richness was consistently higher in low tide channel habitats than in high tide tideflat habitats and that species richness decreased along a gradient from the mouth of South Slough, directly correlated with decreasing salinity. Species richness in the entire system was highest in July, while total abundance of fishes in the system peaked in June (Figure 11). 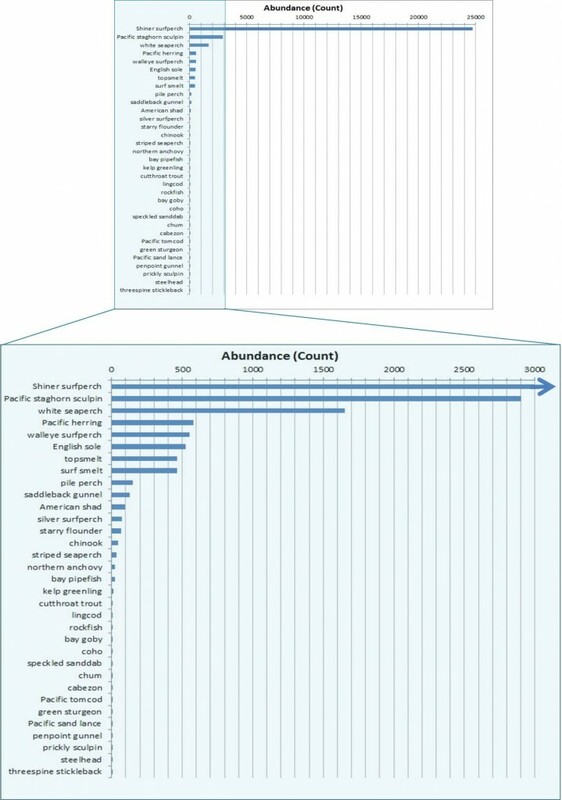 Figure 12 shows abundance of each fish species found in this study. Habitat played an important role in determining fish community structure. Most of the transient marine or anadromous species were found in tidal channels (e.g., rockfish or northern anchovy), while the upper slough appeared to be an important spawning and nursery ground for marine fishes (e.g., Pacific herring and English sole, respectively). Adult white surfperch, adult walleye surfperch, adult topsmelt and adult pile perch represented the oldest and largest fishes found and were almost exclusively found in tidal channels closest to the mouth of South Slough. In contrast, important habitat for rearing juveniles of many species are located in the upper estuary and were the first nursery areas in the estuary to be occupied (generally by shiner surfperch and staghorn sculpin). Of all stations, the upper estuary sampling station (5) produced the highest densities of juvenile fishes by far. Data from ODFW’s long term seining program appear to agree with some of the findings from Bottom et al. Specifically, these data show differences in species richness in lower estuary sampling sites (more species per seine/higher salinity) compared with Coos River stations (fewer species per seine/lower salinity)(derived from unpublished data ODFW2013b). The logical explanation is that large numbers of marine species use the higher salinity portions of the estuary, compared with the relatively smaller numbers of fresh water fish species. 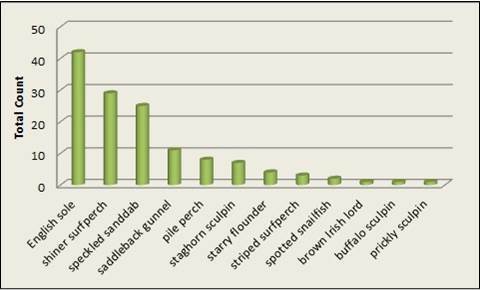 Figure 9: Combined counts of all species found in all trawls for all Coos Bay stations during the 1999 sampling season. Data: Hayslip et al 2006; Sigmon et al 2006. Figure 12: Combined abundance of fish species captured in all sampling events during the Bottom et al. 1988 study. Since shiner surfperch numbers are so high relative to other species, the bottom graph allows for a closer examination of the grey highlighted portion of the lower graph. Data from: Bottom et al. 1988. Bane, G. W. 1968. Fishes of the upper Newport Bay. University of California at Irvine Res. Ser.3:1-114. Bisson, P. A., and P. E. Reimers. 1977. Geographic Variation among Pacific Northwest Populations of Longnose Dace, Rhinichthys cataractae. Copeia. 1977 (3): 518-522. Bottom, D. L., K. K. Jones, and J. D. Rodgers. 1988. Fish community structure, standing crop, and production in upper South Slough (Coos Bay), Oregon. Charleston, Or: South Slough National Estuarine Research Reserve. Coos Watershed Association (CoosWA) 2012. [Coho life-cycle monitoring program]. Unpublished raw data. Eschmeyer, W.N., and E. S. Herald. 1983. A field guide to Pacific Coast fishes of North America: from the Gulf of Alaska to Baja, California. Boston: Houghton Mifflin. Hart, J. L., and W. A. Clemens. 1973. Pacific fishes of Canada. Ottawa: Fisheries Research Board of Canada.Hayslip, G., L. Edmond, V. Partridge, W. Nelson, H. Lee, F. Cole, J. Lamberson , and L. Caton. 2006. Ecological Condition of the Estuaries of Oregon and Washington. Hill, K.T., P. R. Crone, N. C.H. Lo, D. A. Demer, J.P. Zwolinski, B. J. Macewicz. 2012. Assessment of the Pacific Sardine Resource in 2012 for U.S. Management in 2013. NOAA National Marine Fisheries Service, Southwest Fisheries Science Center, La Jolla, CA. Hiss, J.M. 1985. Summary of the Life History of Pacific Sand Lance (Ammodytes hexapterus) and its Distribution in Relation to Protection Island National Wildlife Refuge. U.S. Fish and Wildlife Service, Olympia, WA. Hoffman, Carol Jane. 1980. Associative behavior of the arrow goby, Clevelandia ios (Jordan and Gilbert) and the ghost shrimp, Callianassa californiensis Dana. Thesis (M.S. )–University of Oregon. Kavanagh, P., K. Jones, C. Stein, P. Jacobsen. 2005. Fish Habitat Assessment in the Oregon Department of Forestry Elliott Study Area. Oregon Department of Fish and Wildlife, Corvallis, OR. Kramer, D. E., W. H. Barss, B. C. Paust and B. E. Bracken. 1995. Guide to Northeast Pacific flatfishes: families Bothidae, Cynoglossidae, and Pleuronectidae. Fairbanks, Alaska: Alaska Sea Grant College Program, University of Alaska, Fairbanks. Kruse, G. H. 1984. A simulation model of English sole (Parophrys vetulus) recruitment mechanisms. Thesis (PhD) – Oregon State University. Lassuy, D. R. 1989a. Species profiles: life histories and environmental requirements of coastal fishes and invertebrates (Pacific Northwest) — English sole. U.S.  Fish Wildlife Service Biolical Report: 82(11.101). U.S. Army Corps of Engineers, TR EL-82-4. 17 pp. Lassuy, D. R. 1989b. Species profiles: life histories and environmental requirements of coastal fishes and invertebrates (Pacific Northwest) – Pacific herring. U.S. Fish Wildlife Service Biolical Report: 82(11.126). U.S. Army Corps of Engineers, TR EL-82-4. 18 pp. McPhail, J. D., and E. B. Taylor. 2009. Phylogeography of the longnose dace (Rhinichthys cataractae) species group in northwestern North America – the origin and evolution of the Umpqua and Millicoma dace. Canadian Journal of Zoology. 87 (6). Miller, B. and E. McRae. 1978. Herring spawn survey, Coos Bay, Oregon: winter 1977-78. Oregon Department of Fish and Wildlife. Miller, D. J., and R. N. Lea. 1972. Guide to the coastal marine fishes of California. [Sacramento]: State of California, Dept. of Fish and Game. Miller, J.A., and A.L. Shanks. 2004. Ocean-estuary coupling in the Oregon upwelling region: abundance and transport of juvenile fish and of crab megalopae. Marine Ecology Progress Series. 271: 267-279. Miller, J. A. and A. L. Shanks. 2005. Abundance and distribution of larval and juvenile fish in Coos Bay, Oregon: a time-series analysis based on light trap collections. Marine Ecology Progress Series 305:177-191. Monaco, Mark E., and Robert L. Emmett. 1990. Distribution and abundance of fishes and invertebrates in West Coast estuaries. V1 and v2. Rockville, Md: U.S. Dept. of Commerce, National Oceanic and Atmospheric Administration, National Ocean Service. Oregon Department of Fish and Wildlife (ODFW). 2013b. [Coos fish monitoring seine program]. Unpublished raw data. Oregon Institute of Marine Biology (OIMB). 2013. [Fish class seining and trawling data]. Unpublished raw data. Richardson, S. L., J. R. Dunn, and N. H. Naplin. 1980. Eggs and larvae of butter sole, Isopsetta isolepis, (Pleuronectidae), off Oregon and Washington. Fish. Bull. 78:401–417. Rooper, Christopher N., Donald R. Gunderson, and David A. Armstrong. 2003. Patterns in Use of Estuarine Habitat by Juvenile English Sole (Pleuronectes vetulus) in Four Eastern North Pacific Estuaries. Estuaries. 26 (4): 1142-1154. Schlosser, S. C. and J. Bloeser. 2006. 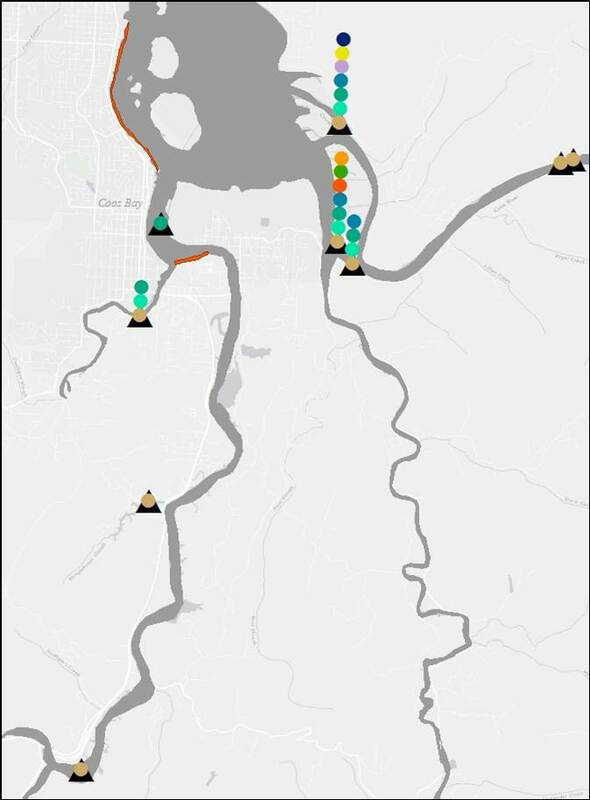 The collaborative study of juvenile rockfish, cabezon, and kelp greenling habitat associations between Morro Bay, California and Newport, Oregon. UC San Diego: California Sea Grant College Program. Sigmon C.L.T., Caton L., Coffeen G., Miller S., 2006. Coastal Environmental Monitoring and Assessment Program. The Condition of Oregon’s Estuaries in 1999, a Statistical Summary. Oregon Department of Environmental Quality, Laboratory.  DEQ04-LAB-0046-TR. Stevenson J.C. 1962. Distribution and survival of herring larvae (Clupea pallasi Valenciennes) in British Columbia waters. Journal of the Fisheries Research Board of Canada. 19:735-810. Stewart, I. J. 2005. Status of the U.S. English sole resource in 2005. National Marine Fisheries Service, Seattle, WA. Suring, E., R.J. Constable, C.M. Lorion, B.A. Miller, D.J. Wiley. 2012. Salmonid Life Cycle Monitoring in Western Oregon streams, 2009-2011. Monitoring Program Report Number OPSW-ODFW-2012-2, Oregon Department of Fish and Wildlife, Salem.